Data Everywhere gives you an easy, flexible, and powerful way to reference and share data between Google Sheets documents. If the source data changes shape or otherwise moves around, you might be left looking at the wrong data. If the source spreadsheet worksheet is renamed, your link is broken. Permissions can be complicated if a user is not a viewer to both the source and destination spreadsheet. 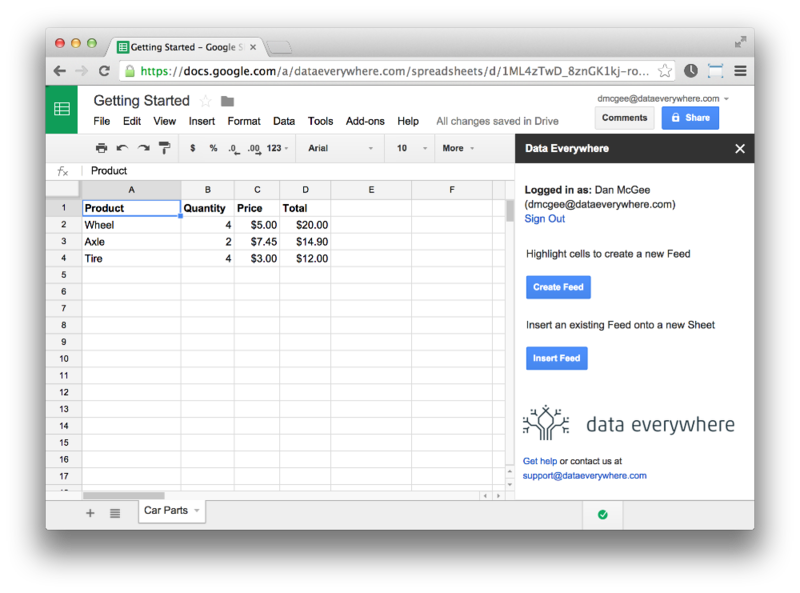 Using Data Everywhere to share data between different Google Sheets documents is flexible and easy. If you don't already have our Google Sheets add-on, you should read the add-on installation instructions to get it installed before continuing. Once you have data you'd like to publish and make available to other Sheets documents, we'll want to share this data using the Data Everywhere add-on. Note that "sharing" the data might mean you only share it with yourself, your data is private unless you explicitly share it with others. If you have the add-on installed but cannot see the sidebar, select the "Add-ons" menu, then "Data Everywhere", then "Start". This data can now be inserted in any other Google Sheets document, and can be kept up to date in both documents. To do so, you may need to open the Data Everywhere Add-on in your new spreadsheet by clicking the "Add-ons" menu, "Data Everywhere", and then "Start". Once the Data Everywhere sidebar is visible, click "Insert Feed". A list of available feed will be shown, one of which should be the descriptive name you entered earlier. Click the "Insert" button to add this data as a new sheet in your spreadsheet. The data you shared earlier is now available in your new spreadsheet, and will be instantly updatable whenever changes are published! If the data shrinks or expands, Data Everywhere will sync the entire contents over, so you don't have to worry about a limited range size being shared between spreadsheets such as when using the IMPORTRANGE function.